The WAD rotary shaft seal is used for the separation of two media or extreme dirt accumulation from the outside for rotating or pivoting shafts. The WAD is a double-action rotary shaft ring for rotating or pivoting shafts. 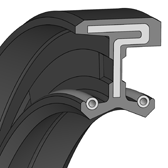 The elastomer outer sheath provides good static sealing, good thermal expansion balance e.g. in light-metal housings, better sealing with greater roughness and secure sealing for split housings as well as good static sealing with thin fluid or gaseous media. Tight and accurate fitting is achieved by the metal outer casing. 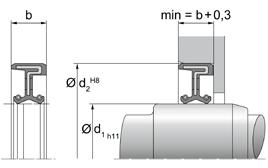 The WBD model has limited sealing action with thin fluid or gaseous media and in split housings. To guarantee high static sealing on the outer surface, better surface treatment of the housing bore is necessary or an additional coat of paint should be applied to the outer casing. The nominal widths mentioned on the following pages represent the standard dimensions. They are generally in stock or can be delivered at short notice. Other dimensions and different designs, e.g. springs or metal inserts made of other steel grades can be produced as well some special designs. Minimum quantities may be obligatory for dimensions outside of the standard. The WAD/WBD models can also be produced in fluoro rubber (FKM).